to our guests from the U.S.A.
June 11, 1776, five men meet in secret...their goal, to draft a resolution by which the 13 colonies would break from rule by the British. These five men (John Adams, Benjamin Franklin, Thomas Jefferson, Robert R. Livingston & Roger Sherman), decided that Mr. Jefferson would write the original draft. When he was done, Franklin and Adams made some minor changes and these changes were incorporated prior to presenting the document to the Continental Congress on June 28, 1776. 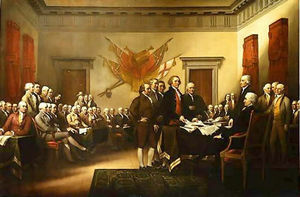 John Trumbull's famous painting is usually incorrectly identified as a depiction of the signing of the Declaration. What the painting actually depicts is the five-man drafting committee presenting their work to the Congress. Trumbull's painting can also be found on the back of the U.S. $2 bill. The full declaration (after some additional rewriting) was adopted at the Pennsylvania State House on July 4, 1776. The original was signed by John Hancock and Charles Thompson. Then a local printer, John Dunlop spent the evening printing 150-200 copies of the document. The original document never survived but there are about 25 original "Dunlap broadsides" in existence. On July 19, 1776, Congress ordered a new handwritten copy be produced and signed by all of the original delegates to sign. 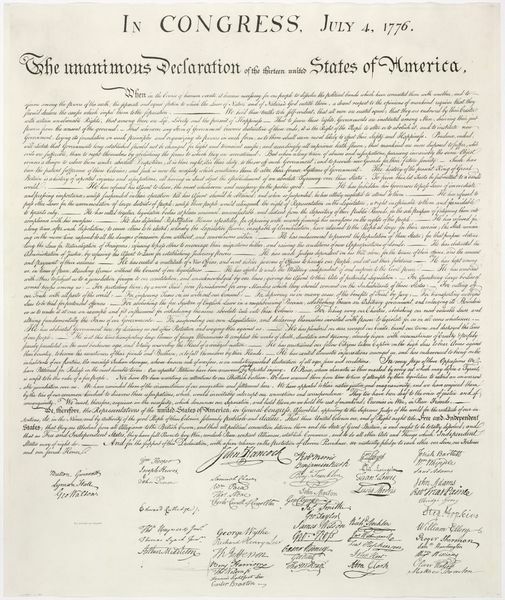 On August 2, 1776, most of the delegates signed this document, in geographic order of their colonies from north to south, though some delegates were not present and had to sign later. Two delegates never signed at all. As new delegates joined the congress, they were also allowed to sign. A total of 56 delegates eventually signed. This is the copy on display at the National Archives. The youngest to sign was Edward Rutledge (26). The oldest, Benjamin Franklin (70). Such has been the patient Sufferance so these Colonies; and such is now the Necessity which constrains them to alter their former Systems of Government. The History of the Present King of Great-Britain is a History of repeated Injuries and Usurpations, all having in direct Object the Establishment of an absolute Tyranny over these States. To prove this, let the Facts be submitted to a candid World. Nor have we been wanting in Attentions to our British Brethren. We have warned them from Time to Time of Attempts by their Legislature to extend an unwarrantable Jurisdiction over us. We have reminded them of the Circumstances of our Emigration and Settlement here. We have appealed to their native Justice and Magnanimity, and we have conjured them by the Ties of our common Kindred to disavow these Usurpations, which, would inevitably interrupt our Connections and Correspondence. They too have been deaf to the Voice of Justice and of consanguinity. We must, therefore, acquiesce in the Necessity, which denounces our Separation, and hold them, as we hold the rest of Mankind, Enemies in War, in Peace, Friends. We, therefore, the Representatives of the UNITED STATES OF AMERICA, in GENERAL CONGRESS, Assembled, appealing to the Supreme Judge of the World for the Rectitude of our Intentions, do, in the Name, and by the Authority of the good People of these Colonies, solemnly Publish and Declare, That these United Colonies are, and of Right ought to be, FREE AND INDEPENDENT STATES; that they are absolved from all Allegiance to the British Crown, and that all political Connection between them and the State of Great-Britain, is and ought to be totally dissolved; and that as FREE AND INDEPENDENT STATES, they have full Power to levy War, conclude Peace, contract Alliances, establish Commerce, and to do all other Acts and Things which INDEPENDENT STATES may of right do. And for the support of this Declaration, with a firm Reliance on the Protection of the divine Providence, we mutually pledge to each other our Lives, our Fortunes, and our sacred Honor. 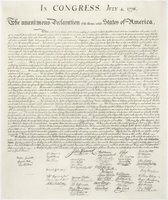 "that whenever any Form of Government becomes destructive of these Ends, it is the Right of the People to alter or abolish it, and to institute new Government, laying its Foundation on such Principles, and organizing its Powers in such Form, as to them shall seem most likely to effect their Safety and Happiness." Over the centuries, our ancestors have righted these wrongs and given those who were once slaves their freedom and women the right to vote. Did these changes come easily? Of course not, change is never easy. The change that these men saw fit in the 1700's was certainly not easy. The civil war pitted brother against brother in some cases. The fight for a woman's right to vote was long and hard. For the most part the changes that have needed to be made have been made. Are we perfect today? Like our ancestors, we are not. We have many things that we still need to change and slowly over time we can only hope they will. Will they change without struggle? Again...no. But the UNITED STATES OF AMERICA is built on the words that change can be made...and without those words who knows what our lives would be today. Today we celebrate the day these patriots stood up to a government that was intolerable. We get together with friends and loved ones and enjoy the company of all. We barbeque and eat and drink and laugh and smile. Many wil l watch the fireworks - which represent the battles that took place during the original fight for freedom. What we no longer do, it seems, is stop to reflect on the lives that were lost during this struggle and the lives that have been lost in the many struggles that followed. Not only the wars we fought with our military (we have days to honor those brave men and women)...but the lives that were lost fighting for freedom within the USA. The lives lost by those who fought for racial freedom. The lives lost by women during their struggle for equality. The lives lost over the right to choose. The lives lost by those who have protested what they have felt are unfair policies of our govenment. All these lives have been lost in the continuing struggle to get it right. I certainly can not answer that question, but I can certainly hope and pray we do our best to get as close as possible. We are not perfect...but we could be so much less perfect without them. COUCH NOTE: Have you ever read all the lyrics? So much more there than just the first verse which praises our land. The verse every child knows. The remaining verses praise the people and the struggle that was fought and won. Katharine Lee Bates wrote the original version in 1893. She wrote the 2nd version in 1904. Her final version was written in 1913.
didn't know the verses were written over such a length of time. Cool. Being the music guy...I assume you've seen the kinda goofy movie version of the musical, "1776" I am one of a very few who actually enjoy it. Thank you soo much for this great post. I'm from Poland and live in Amerika 5 years. Your post is very helpful and informative to me. Thanks for music and specialy for words "America! America!" I got up early today and my first choise was your blog. I had super intuition. I found what I needed. Big Thanks! Thanks for putting this up again, Vinny. Very well written and worthy of a repeat every year. Happy 4th my wonderful friend. It was a gem when you first posted it and continues to be. Happy 4th dear Vin. Am thinking of you. I always wondered why "America the Beautiful" was not our anthem. I think it should be, don't you? This is truly a great post Bond, thank you. I loved Elvis but was unable to get Ray to play. Tremendous post my friend. Happy Independence Day. I was most confused trying to work out why you were posting this on the 7th March 2006.... Doh! Wishing a very Happy 4th of July and a Happy Wednesday to you and yours from me and mine in Germany, dear Vinny! Great post Vinny =) Just stopping by say hi and hand out *hugs*!! Makes you wish that I was a signer of THE DECLARATION OF INDEPENDENCE. Oh well, I am just happy to be here.